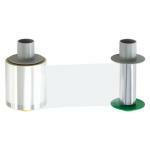 Genuine Fargo 84054 HDP holographic film: Universal orientation with high security Orbit design. This reverse transfer film gives Fargo HDP5000 users the ability to apply holograms to their ID cards without using a lamination module. Fargo HDP Film is required for printing with Fargo HDP5000 printers. Prints 500 images per film. Compatible with the following Fargo printers: Fargo HDP5000 series.